The English Schoolhouse: Why is smoking such a big hit with Roman teens? Why is smoking such a big hit with Roman teens? That's a question that's been on my mind a lot lately. Our house is right around the corner from a middle school, and on a number of occasions I've walked past the exit of the school right around dismissal time. For the most part, the scene is what you'd find in any normal school when it's quitting time, groups of friends gathered and joking around, boys chasing girls or vice versa, play fights--but oftentimes there's a dynamic that I don't think I'll ever get used to seeing: kids smoking on their way home. It is my opinion and mine alone that cigarettes are given a distinctly different treatment here in Italy than they are in the states. Whereas I grew up on public service announcements urging the viewer not to smoke and annual "Just Say No" initiatives in elementary and middle school, I don't know to what extent Italian kids, particulary Romans, are being discouraged from smoking. Today I hung out with Elisabetta, a 16 year-old high school student and asked her some questions I'd been wondering about regarding the prevalence of teen smoking in Rome. 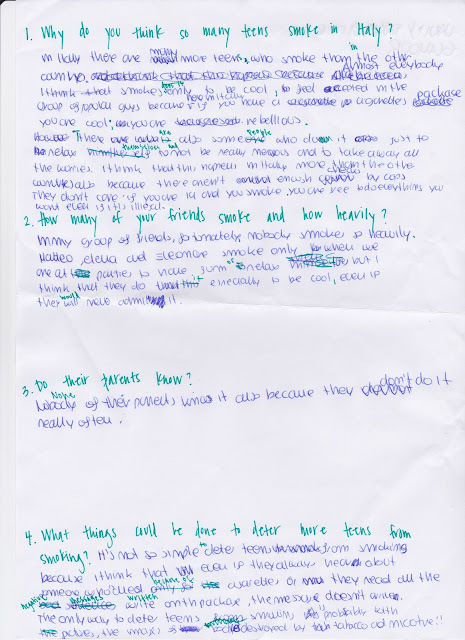 For writing, spelling, and grammar practice, I wrote out my questions and she responded by writing her answers--then we reviewed, corrected, revised, and discussed. Why do you think so many teens smoke in Italy? In Italy there are many more teens who smoke than in the other countries. Almost everyone who smokes does so only to be cool or to feel accepted in the group of popular guys because here in Italy if you have a cigarette package, you are cool. You are rebellious. How many of your friends smoke and how heavily? In my group of friends, fortunately, nobody smokes so heavily. Matteo, Elena, and Eleonora smoke only when we are at parties to have fun or relax, but I think they do it especially to be cool, even if they would never admit it! None of their parents know--it's also because they don't do it really often. What things could be done to deter more teens from smoking? It's not so simple to deter teens from smoking because I think that even if they always hear about someone who's died because of cigarettes or they read all the negative messages written on the package, the message doesn't get through. The only way to deter teens from smoking is probably with the pictures, the images of bodies destroyed by tobacco and nicotine! The article stated that in the states, teen tobacco use isn't decreasing steadily the way it has been in the past. 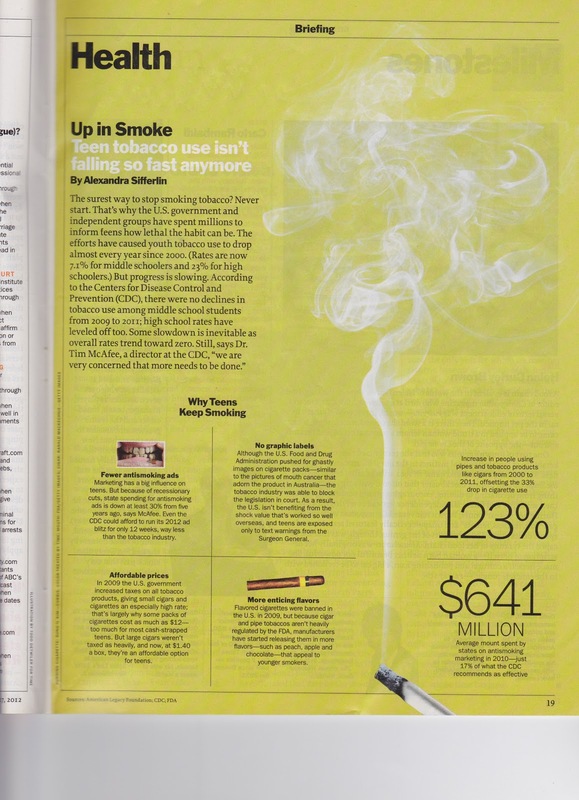 It also noted smoking rates in America to be 7.1% for middle schoolers and 23% for high schoolers. Elisabetta, upon reading the statistics, scoffed at the math. "I think in Italy it would be 80% for high schoolers. You can't even go into the restroom without walking into a cloud of smoke. People smoke in the school..."
I was puzzled for a moment, then asked, "Well what about the teachers? Isn't there like a hall monitor or something? A teacher on duty?" Elisabetta smiled and said, "The teachers smoke too...my English teacher, for example, schedules a smoke break during class, not just for herself but for everybody." Houston, we have a problem. I'm stocking up on "just say no" PSAs for the future.